What are your carpet cleaning prices? How much do you charge to clean.....? These are questions many buyers of carpet cleaning services first ask. Do they ask this because they are basing their decision on price, or is it they don't know what else to ask? Unfortunately, price is one of the most common denominators used to evaluate a carpet cleaning service. Call 10 different carpet cleaners and you will get 10 different prices. What are the going rates? Why do some carpet cleaners charge more, and are they really worth it? So how do you choose? What you must keep in mind is that carpet cleaning is a service not a commodity. The old adage applies: "you get what you pay for". Does paying high carpet cleaning prices equates to a better job? Not necessarily. It does mean, however, that the value of the services performed and the results achieved should justify the price. 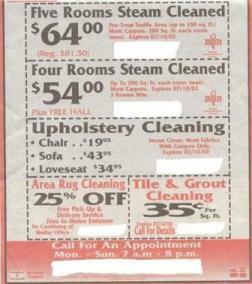 Some carpet cleaners advertise a very low price per room. The problem is no company can pay for trained employees, gasoline, equipment, professional cleaning products, insurance and other overhead, and give quality service for just $9.95 per room. This type of cleaning operation relies on a low price to get in the door and then use high pressure sales to increase the cleaning total. This tactic is known as "bait and switch". If the carpet cleaning prices seem too good to be true they are. At the other end of the spectrum is the carpet cleaning process performed by an Institute of Inspection Cleaning and Restoration Certification certified cleaner. All technicians at New Life Carpet & Upholstery Service are IICRC certified and perform the following steps to deliver the most value for your money. Our cleaning begins with a thorough pre-inspection to ascertain any problems or concerns with the carpet like wear, spots or stains, what to expect from the cleaning and any recommendations. We begin the physical cleaning process by thoroughly pre-vacuuming the carpet to remove as much of the dry particulate soil as possible. A safe and effective cleaning solution formulated specifically to address the spots, spills, traffic lanes or other areas of concern is then sprayed on the carpet. The carpet is then scrubbed by an oscillating floor machine and pad designed to loosen embedded dirt for maximum soil removal. The soil, allergens and other harmful contaminants are then cleaned from the carpet with an absorbent pad. To ensure faster drying times (1-2 hours), a third pad is utilized to remove any remaining soil and moisture. General spot cleaning is included in the price, however, some stain removal may require additional cost. Deodorizing is also included in the price, however, there would be an additional charge for specialized odor removal like pet urine. Any furniture that is moved is tabbed by placing a plastic square under each furniture leg or placed on blocks to prevent rust or the furniture's stain from transferring to the carpet. This service is included in the price. Typically as a last step, an application of a carpet stain protector is applied to the cleaned carpet to help repel future spots and spills and slow down the rate of re-soil. There is an additional charge for the stain protector treatment. Before the technician leaves, a final inspection is conducted to assure your satisfaction. Re-affirmation of the company's guarantee is provided, as well as after cleaning care instructions. A free bottle of spot remover is given to you as a gift and can be used to clean any future spots and spills that may occur. A business owner must price their products and services to stay in business. The carpet cleaning prices a company charges should be based on its operating costs for the services provided, not based on what the competition charges. When shopping for carpet cleaning service, compare the value of the service not the price.